Today at PamLloyd HQ we had a delivery of lovely fresh British watercress from The Watercress Company. I got to bring a bag home to experiment with and decided to make this tasty salad full of seasonal ingredients (its peak watercress & asparagus season right now). I have adapted this recipe from one on the British asparagus website. Place your British asparagus into a roasting dish, add the olive oil and place in the oven for 10-12 minutes. In a hot frying pan add the slices of chorizo. Cook on both sides for 2 minutes until the paprika oil oozing out of the slices. Meanwhile place a pan of boiling water on the hob and bring to a fast rolling boil. When you have 3 minutes to go before serving crack your 2 eggs into the boiling water and immediately lower the heat to low-medium for 2 minutes. Then turn the heat off completely. Remove the British Asparagus from the oven. 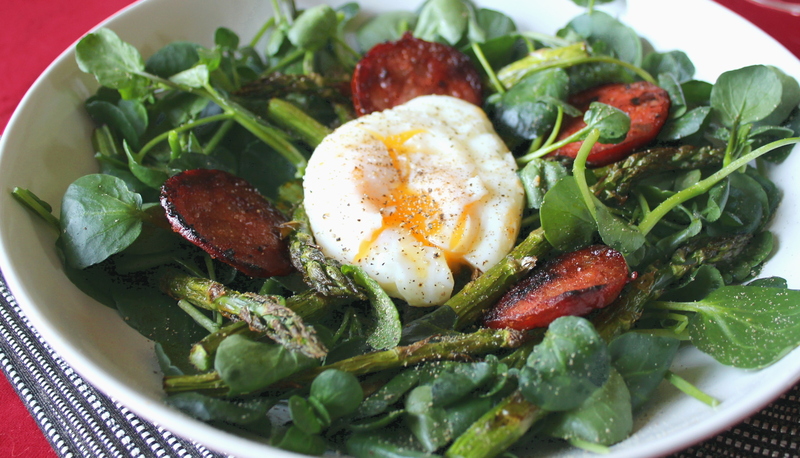 Put two handfuls of watercress in each bowl and top with the asparagus, sprinkle over the hot chorizo slices, and with a slotted spoon add the 2 poached eggs. Finally drizzle over the paprika oil and season with salt and pepper.